Moisture Sensitive Devices (MSDs), must be managed correctly because "a single mistake" on a tray or reel of MSD causes "negative impact on the entire production batch". Electronic components (like QFP, BGA or SOIC for example), LEDs and Printed Circuit Boards, when extracted from their original protective package, absorb humidity from the environment and during the soldering process the trapped moisture can vaporize and exert internal package stress. Possible damages are: package cracking (popcorn), interfacial delamination, thermal or electrical connection interrupted and possible long-term corrosion. J-STD-033 "Handling, Packing, Shipping and Use of Moisture/Reflow Sensitive Surface Mount Devices"
SMD components are classified into moisture sensitivity levels from 2 to 6. A higher level means more sensibility to the absorbed humidity during the soldering process. The standard specify how to pack SMD components and, in particular, from level 2a to 5a it's required a Dry Pack: desiccant material and a Humidity Indicator Card sealed with the SMD packages inside a Moisture Barrier Bag. Every component has a limited time period (Floor Life) after removal from the Dry Pack and before the solder reflow process. Exceeded this allowable time period it's necessary to bake the component at 40°C, 90°C or 125°C. IPC-1601 "Printed Board Handling and Storage Guidelines"
It provides indications about handling, packing, storage and baking of laminates and printed circuit boards (PCB) both to manifacturers and assemblers of PCB. Dry cabinets provides a "safe place" to temporary stock the MSDs removed from their original Dry Pack before soldering process. In fact the J-STD-033 tells that under 5% RH the Floor Life is congealed. 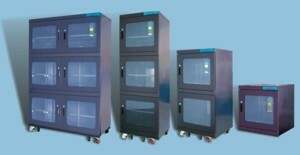 Some cabinets version shown on pages 70-71 can do 40°C low baking process of SMD components. At this temperature the reels are not damaged and can be afterwards inserted into the feeders of the pick and place without problems. According to the IPC-1601 baking of the PCBs should be done at 105-125°C for 4-6 hours into a forced air recirculating oven. For SMD components the J-STD-033 specify three temperature: 40°C, 90°C and 125°C. How long to bake depends on the moisture sensitivity level and package type and body thickness. In the worst case is 79 days for 40°C baking, 10 days for 90°C baking and 96 hours for 125°C baking. Once baked MSDs have their Floor Life restored to the initial value. After reels extraction from their Dry Pack and partial assembling and soldering of the components, what to do with the left parts? 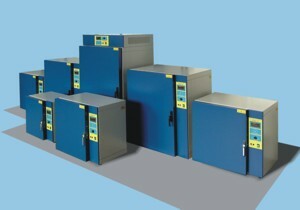 The ideal solutions are to solder them immediately before Floor Time expiration or to store them into a dry cabinet. 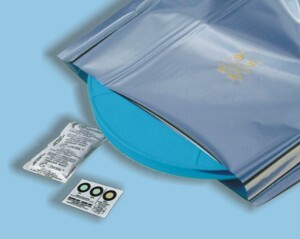 In alternative it is possible to seal them again into a new Dry Pack like the one shown above. To seal the moisture barrier bag it is needed a heatsealers.